EPI: What’s going on in IFEM’s world? Dr. Lee Wallis: These are very exciting times for IFEM, as always, which is both invigorating and exhausting in equal measure. The spectrum of things going on amongst the membership is really inspiring. Some recent highlights. There is a position paper coming out on crowding in emergency departments, stemming from the Netherlands Society’s June symposium. Crowding in emergency departments is a major problem worldwide. There are talks with the Ministries of Health in Guatemala, Spain, and Tonga, lobbying for support of emergency medicine development. There are new special interest groups for critical care, behavioral emergencies, and trauma. The bulk of IFEM work and activity lies in committees and interest groups, but there is a frenzy of behind to scenes work. The IFEM Foundation is a US-based charity that receives donations in support of IFEM’s work. Now 18-months in the making, and still in its very early stages, is the IFEM Institute, which will be an organization attached to IFEM that does educational and system development work with in-country partners. We already have a couple potential projects lined up which are ready to get off the ground when the Institute is up and running. IFEM is a volunteer organization and it’s a priority to continue to make it more sustainable. One pressing reason for this is that we’ve been collaborating with the WHO on projects related to emergency care systems development, and to continue to have that opportunity we need to be a sustainable organization. EPI: What’s the latest with the African Federation for Emergency Medicine (AFEM)? Wallis: I’ve returned to some within-Africa travel this year, which has been nice. Kenya just had their first emergency care conference. EM is now a recognized specialty in Kenya, and they’re working to launch an EM residency. 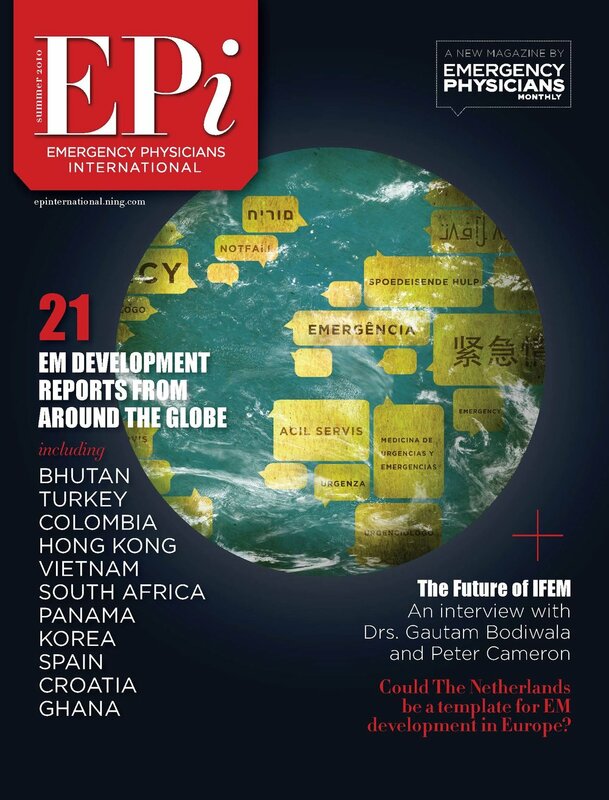 Uganda is about to launch their first EM residency, too, and AFEM has been involved in its development. The Emergency Care Outcomes Project in Uganda and Tanzania pushes on; we’ve completed a year of pre-intervention data collection, implemented the intervention package, and are now a few months into the year of post-intervention data collection. We are limited by the resource envelope and sample size, but the central goal is to add robustness to the literature supporting the value of low-cost interventions – like triage and clinical checklists. With ECOP we’re directly measuring mortality as an outcome. We have teams on the ground in Uganda, Tanzania, and Cape Town. A challenge for both IFEM and AFEM is that our new members, inevitably, are almost always countries without established emergency care systems, and often are looking for longitudinal partnership that necessitates more than trainings that last two or three days around a conference. Longitudinal engagement is challenging for both AFEM and IFEM considering the limited resources; it’s a question of how thin you can spread our resources and still make meaningful impact. I find it a source of personal frustration; I feel like I’m always letting people down. Part of my job as IFEM President is managing member societies’ expectations on what IFEM can and can’t bring to a problem. EPI: How do you prioritize all the different projects and partnerships in IFEM’s pipeline? Wallis: for my personal involvement or travel, it mostly has to be on a first-come, first-serve basis, depending on what else is going on that year and what level of resources exist and are needed. I’m very poor at saying no. This is a problem of my own. And I’m very good at telling people who I’m mentoring that you have to learn to say no, and I’m very pleased when people start saying no, unless they start saying no to me, in which case it gets very awkward! I try to limit project travel to three places per month, because after all I have a day job and a family. This year has been crazy for travel. I’ve been all over, some places I’ve been before, and some places I hadn’t been. EPI: I imagine it’d be hard to find a place you haven’t traveled to at this point. Wallis: Ha… I went to Singapore for the first time. And Bethesda [Maryland, USA]. And everywhere in between. Because everywhere is so difficult to get to from Cape Town there’s never really enough time on the ground to appreciate the culture, the people, and the place that I’d want. You go to Seoul for 2 days and you’ve seen the inside of a conference room. Thankfully, Abbi [wife] will be joining me in Mexico City for ICEM 2018 in June. We’ll stay after for a week. And for the EMSSA Conference in October the family will join, and the kids will enjoy Sun City. Becca Corder is a Partner Data Operations Analyst at Doctor.com.